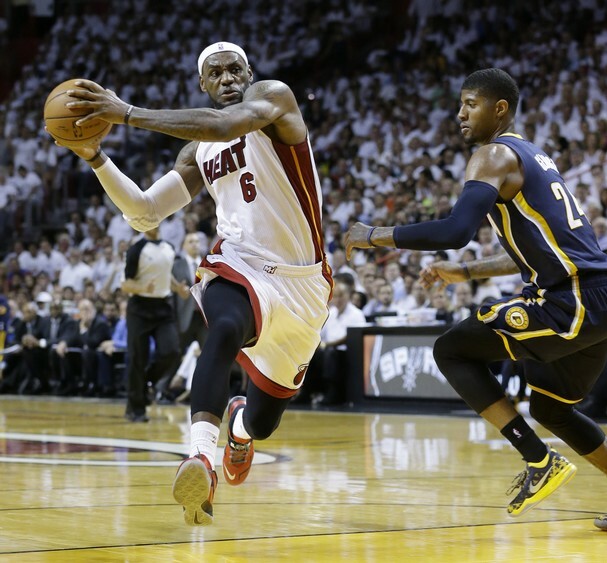 LeBron James (6) drives the ball as Indiana Pacers forward Paul George (24) defends, during the second half of the Miami Heat’s Game 4 win Monday night, the defending champs are now up 3-1 in the Eastern Conference Finals. Michael Walton II is following the NBA throughout this playoff season. Michael is a student, freelance writer and burgeoning high school basketball scout based in Chicago. He’s previously been published in TrueStar Magazine, the Redeye Chicago and thelyricallab.com. After all the talk during the regular season about how much they wanted to secure the No. 1 seed in the East and the playoff home-court advantage that went with it, the Indiana Pacers got exactly what they wanted. The previously spurned Pacers, eliminated the last two years by the Miami Heat, also got their desired Eastern Conference Finals matchup with that hated rival. It took a scorching-hot start in the regular season to get all these things, but unfortunately this team at some point fell off a cliff and whatever emerged from the canyon they landed in is more in need of a personal care than a battle with LeBron James, who was at his most physically dominant through much of Miami’s 102-90 win in Game 4 Monday night. We’ve reached a moment of truth with Indiana. No team has saw so much both fall their way and fall apart in one season — Miami is arguably a shell of who they’ve been in winning the last two NBA championships but the Heat still had the resolve to control this ECF series 3-1 after four grind-it-out games. They haven’t received the best of their opponent, and outside of their great Game 1, haven’t come close to providing their best — there’s no choice now for Indiana, they will need to bring their A-game to beat a veteran Heat squad that will be going all out to end this series immediately. Chris Bosh is often an overlooked element in Miami’s star-studded lineup, even though he is one of the more critical components of Erik Spoelstra’s spread offense. Bosh often plays great defense while bringing opposing bigs out to the perimeter on offense, he is still able to be effective without scoring a lot, but dropping nine points in the first three games against the Pacers had to have the Heat worried. Bosh squashed any doubts for the time being by having the great game that teammate LeBron James said he would have. In Game 4 Bosh had 25 points, including his hitting 3-of-5 3-pointers and 8-of- 10 free throws. Both shooting numbers are important because they show that he was playing with the kind of aggressiveness that the Heat need from him in order to win this series. When Bosh is playing well it usually means Indiana’s Roy Hibbert is not, and now that Bosh has found his range it could be lights out for the Pacers. The Pacers got off to such a strong start in the regular season that it was inevitable that they would gain bandwagon fans along the way. Paul George was in the discussion for MVP early on and both he and teammate Roy Hibbert made the All-Star game. It was starting to look like the Pacers were in the enviable position of housing two young superstars, the type of players who can single-handedly change a series in your favor or at the very least produce consistently. George has been his usual self this series, averaging 19.5 points per game while being tasked with guarding Dwayne Wade or James each night. His three-point shooting percentage against the Heat is at 35%, which probably needs to be a little bit higher if they still plan on making the NBA Finals, regardless he disappears at times which can’t be tolerated from someone who wants to be considered one of the elite players in the L. In the Pacers’ Game 2 loss George shot 25% from the field. A game like that, which in general can be seen as an anomaly, could be acceptable especially with the Heat guarding you, but George also only got to the free throw line six times in that game, a sign of timidness in his game. 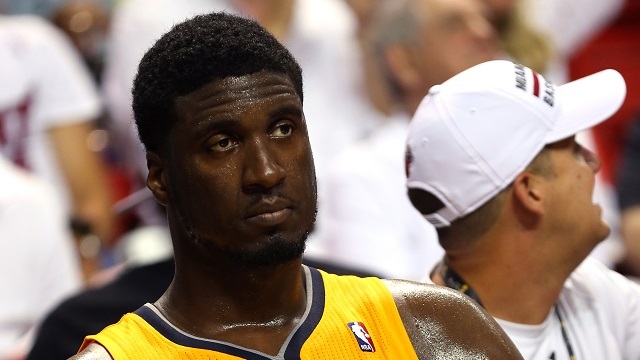 Hibbert, meanwhile, is so good at disappearing that we might as well start calling that man Houdini. Hibbert’s up-and-down roller coaster year has been well-documented, but the one team he usually shows up against had been the smallish Miami Heat. According to ESPN.com, before Monday night’s scoreless outing, Hibbert had scored 12 or more points in his past ten playoff games versus the Heat. Of course last night he dropped his giant goose egg while playing 22 minutes and while getting dominated by Bosh from the perimeter. So at this point we also have to ask, are George and Hibbert superstars? Nope and hell nope. Lance Learns When to Shut Up….Maybe? LeBron laughed off those statements and responded with a 32 point/10 rebound/5 assist/2 steal game reminiscent of his dominant performance against the Boston Celtics in the 2012 playoffs. James is a man on a mission right now,the way he has taken to repeatedly answering his challengers with authority as of late (Paul Pierce, stand up…) he clearly wants to be in that rarified air with MJ. Stephenson has had an amazing breakout season and in my opinion made a better second All-Star from Indiana than Roy “Where’d he go?” Hibbert,” but Stephenson has to learn that when it comes to the truly transcendent players in his league he doesn’t have much beyond that mouth to match up with them, so it’s better overall for him to keep it closed.